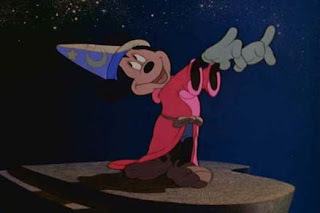 I am continuing my quest to OSR-ify all spellcasting classes and make them all GLOG Wizards in increasingly elaborate hats. Thus, it was only a matter of time for the Druid to come under my purview. For further reading, see here and here. No sane person would go into a Forest in Nukaria, or any other type of wilderness. The wilderness hides many things, from savage people to wild animals to Magical Beasts and much more. If people must leave the safety of civilized lands, they do so in large caravans with many guards and they stick to the roads. The Orzanian Empire, the dominant world power and your likely governors, is large and loosely connected, with few urbanized areas, with most of the population being scattered about in de facto independent city-states, even if the City Elders have sworn an oath of allegiance to the nearest Imperial Saptrap. This leaves large patches of thinly-peopled lands, as well as areas of genuine wilderness within the bounds of the Empire. Even in the best of times, traveling the Imperial Roads is an exercise requiring caution and preparation. You will need a few weapons and some companions to ward off bandits or wild animals, some money to bribe tax-collectors or Road-Wardens and a map in case you get lost. As often dangerous as it can be to travel on the Imperial roads or within the lands of a civilized nation, the wilderness is worse. No sane person would go into a Forest in Nukaria, or any other type of wilderness. The wilderness hides many things, from savage people to wild animals to Magical Beasts and much more. If people must leave the safety of civilized lands, they do so in large caravans with many guards and they stick to well-trodden paths. There is a reason why the job of Adventurer exists- it is because they are among the few crazy enough to wander into the wilderness and fight the savages on their own turf. This often leads to many of them dying grisly deaths, but a few of them are good enough to beat the monsters at their own game. Of all the many dangers of the Wilds, few are more dangerous than the Druid. The Druids are people who abandoned their tribe, culture and religion to follow a savage, primitive religion. They are the naked priests of a monstrous anti-religion, the heralds for Green and the wrath of the wild. Few are foolish enough to enter the territory of a Druid Circle, as Druids are not only incredibly dangerous, but are also ludicrously territorial. Druids will kill anyone they catch intruding in their territory. They hate the City and anyone who associates with it. They prove this by leaving the shattered skulls of intruders on the edges of their territory, the top of the skull broken open so the Druids could scoop the brain out and eat it, as a warning to others. Often people who regularly pass by or through this area will name the skulls or decorate them with flowers, in the hope of distracting from the fact that just by being near a Druid, they are risking their own lives. To the Agents of Law, Druids are a menace, because they are trying to destroy civilization. Druids hate them. To the Servants of Chaos, Druids are an unreliable ally, because the Druids insist that philosophy and symbolic thought itself are the true evils. Druids sometimes ally with the Servants of Chaos, and sometimes the Druids eat them too. To the Minions of the Dark Powers, Druids are evil. Druids think the same about the Minions. To the Brotherhood of Broken Chains, Druids are violent savages. Druids are also bad for business. Druids agree, after all, that is the point. To the Handsome Men, Druids are gross, smelly and unsophisticated, and thus, deserve to be either rescued from their imperfections or be destroyed. Druids hate the Handsome Men, because they sold out. 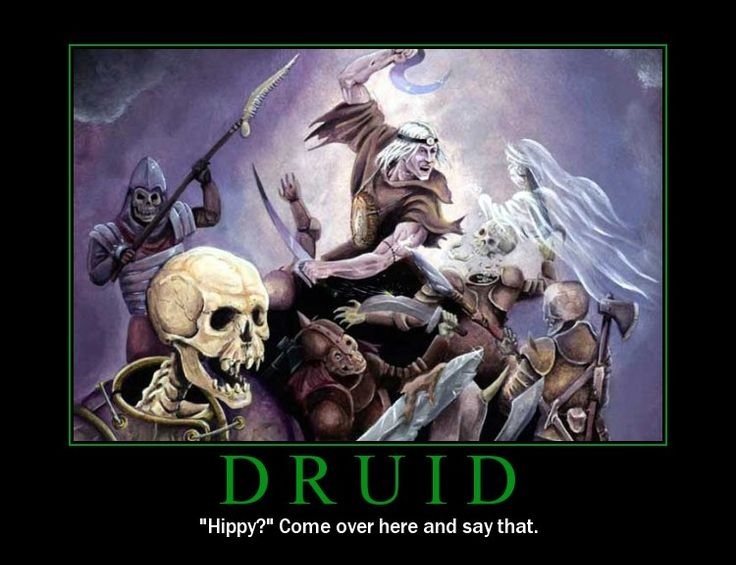 To the Folk, Druids are wonderful. They are trying so hard to undo the damage their former people have caused. They are to be commended and aided for this. This isn't always true, however, as Folk are fickle allies, of course. The Druids basically idolize the Folk, or Bears, depending on the specific sect. Druids will tell you they don't have a religion. Or at least, they would, if they didn't hate you and only spoke in the most dire of circumstances. Most would classify them as having a religion though. The Druidic Faith is simple. The only true evil is symbolic thought and everything that flows from it. That means language, civilization, marriage, bread, shoes and most of everything else you can think of is evil to the Druid. 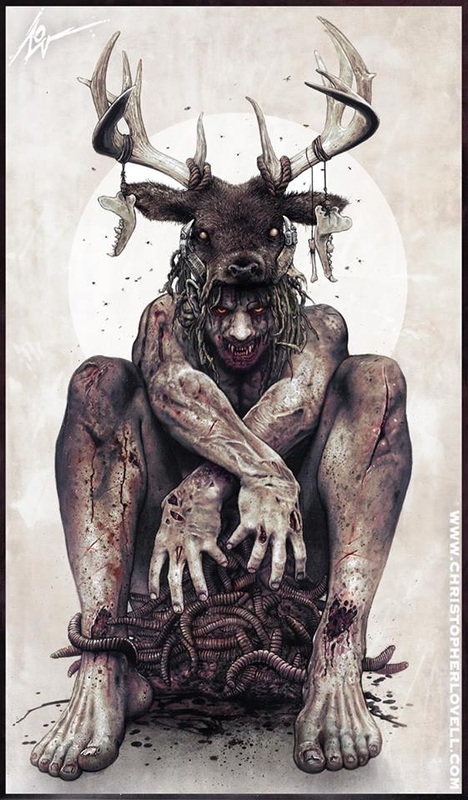 Conversely, the prime commandment of the Druidic Faith is to live as animal does. Take what you desire, hunt and forage, and do whatever is necessary to ensure your own survival and the perpetuation of your line. This is the highest virtue for the Druid. Druidic religion is the reason for why they do what they do. It is the reason Druids kill woodsmen and besiege cities and spread plague and assassinate kings. It is the reason Druids refuse to wear clothes and live in the furthest reaches of the wilderness. It is the reason why they mostly abhor civilized folk and shun them. The Druidic Religion does not have any Gods, or at least, no Gods with any names. Instead of Angels, it has the Folk, and instead of Demons, it has the Civic Demons, such as the Medictor, the Iron Fey, and the ancient servitors of the long dead Ancients. If you wish to play as a Druid, you should probably wait for an Evil Campaign, or one that is based on playing as the Servants of Chaos. However, if you must, talk to your Referee first. If your Referee agrees, then you will need to decide on two things as a Druid- what type of wilderness you came from, and what your Druid Circle was like. You may decide yourself, or roll on the tables below. What type of Wilderness were you from? 1- Forest. Your starting Wild Shape form can be a deer, a boar, or a wolf. 2- Foothills Your starting Wild Shape form can be a hawk, an ibex, or a Ratel (honey badger). 3- Mountains. Your starting Wild Shape form can be a mountain goat, an eagle, or a snow leopard. 4- Prairie. Your starting Wild Shape form can be a rabbit, a condor, or a lion. 5- Steppe. Your starting Wild Shape form can be an argali, a brown steppe bear or a vulture. 6- Desert. Your starting Wild Shape form can be a hyena, a camel, or an ostrich. 7- Tundra/Cold Desert. Your starting Wild Shape form can be a swan, a marten, or a bear (white or brown, it's your choice). 8- Swamp/Bog. Your starting Wild Shape form can be an alligator, an anaconda, or a flamingo. 9- Coastline. Your starting Wild Shape form can be a shark, a coconut crab, or a seal. 10- Lunar Valley. Your starting Wild Shape form can be a Glornak, an Raxil, or a Luna Wolf. What is my Druid Circle like? 1- The Alpha Druid was my father (or mother), and the other members of the Circle are his wives and my siblings and half-siblings. 2- My Circle was rather lax, with the Alpha Druid frequently raiding nearby towns to steal women and food and few objected to this practice, or at least to voice their concerns. 3- My Circle was isolationist, rarely speaking to anyone, even other Druid circles. If anyone who didn't belong to our Circle entered our territory, we killed them. 4- My Circle was radical. We worked to destroy the cities and towns around us and killed anyone who resisted us. 5- My (former) Circle expelled me for some sin. I must work to get back into their good graces. 6- My Circle has sent me here on a secret mission. I need to complete my mission and after that, I will probably return to them soon. The Druid is a sub-class for my basic OSR Wizard class. For any other details, see the base class here. Power: You automatically begin with the spell Wildshape. Drawback: You have sworn an oath of savagery. If you ever break this oath, you must repent before you cast any more spells, including Wild Shape. If you continue casting spells without seeking out a Druid Elder or an Archdruid and confessing your sins to them and probably performing some act (a quest) for them to prove your sincerity, you will be hunted by other Druids until you die. When you create a character, decide on what your Oath of Savagery is, or roll on the table below. 2- To never wear clothes. 3- To never use weapons or tools. 4- To never use money, buy or sell. 5- To never follow the customs of civilized people. 6- To never ask for something when I could take it. You transform yourself into an animal which you have killed and eaten its heart. You gain all the physical traits of the animal, except for HP and FS, you keep your own for that. You also lose any abilities that were dependent on your normal body, such as speech, spellcasting, and other things (Referee's discretion). You retain your own mental attributes. If appropriate, when traveling into an animal that is hardy or hard to kill, such as a wolf, elephant, baboon or etc, you gain +[sum] FS for the duration. This bonus does not apply to animals that are either easy to kill or smaller/more fragile than your base form. Finally, while in an animal form, you can communicate with other animals of that same variety as if you shared a language. You or a creature you touch gains [dice] of the features listed below. Bear's Strength. You gain a +[dice] bonus to STR checks and damage rolls for the duration. Mongoose's Agility. You gain a +[dice] bonus to DEX checks and attack rolls for the duration. Echidna's Constitution. You gain a +[dice] bonus to CON checks and reduce poison damage by [dice] for the duration. Badger's Will. You gain a +[dice] bonus to WIL and Fear checks for the duration. Fox's Cunning. You gain a +[dice] bonus to WIS and perception checks for the duration. Eagle's Splendor. You gain a +[dice] bonus to CHA checks and checks made to intimidate or persuade for the duration. You or one creature you touch grows natural weapons from their body. These can be claws, horns, an enlarged jaw, a barbed tentacle or anything else you wish (Referee's Discretion). - Your weapon can inject venom upon a hit, causing you to deal an additional +1d6 poison damage. - Your weapon is covered in viscous slime, making it stick to whatever it touches. This stickiness is strong enough to support the weapon's wielder for the duration. - Your weapon saps energy from the person hit, giving them a -[dice] penalty to any additional attacks. - Your weapon is magical, for the purpose of overcoming certain immunities. It can also harm purely spiritual entities, such as ghosts and etc. One target creature within range becomes surrounded by a swarm of biting flies, beetles and locusts. To anyone but them within 10', the swarm of insects deals 1d6 damage a round, save for half, with a minimum of 1 damage dealt. The spell remains active until [sum] damage has been dealt. Then the remaining insects fly away. You cause a terrible series of localized tremors that strike all within range for the duration. All living creatures must succeed a save or fall prone. In the outdoors or the Wild, this spell would be scary, but largely non-threatening. However, in a city or settlement, it could cause considerable damage. If this spell was cast with 1 [dice], assume it only knocks over the most rickety of structures. If it was cast with 2 [dice], assume it can knock over some poorly constructed buildings, with a destruction rate of 20%. If the spell was cast with 3 [dice], it can knock over all but the strongest buildings, as well as destroy walls and damage fortifications. Assume 50% of the buildings within range are damage. If the spell was cast with 4 or more [dice], assume it can destroy anything but buildings specifically designed to resist earthquakes or enchanted to be stronger than usual, leveling 70% of the structures within range. The caster bursts into flames. Anything they touch that is flammable or a living creature that could be affected by fire takes +1d6 damage upon contact with them. For [dice] rounds, the caster takes no damage. But after that, they will begin to take damage, as if they were actually one fire. The caster may extinguish the flames at will. You wrap [dice] creatures in mud, sticks, leaves and other natural debris from the environment around them, covering them in it. As long as they remain in the type of environment where the disguises were crafted, they receive a bonus to any checks or saving throws made to hide, sneak or remain concealed equal to 1d6+[dice]. [dice] creatures within range must save. If any of the creatures targeted have HD greater than or equal to [dice], they may add the difference to their saves. If any of the creatures targeted have HD 3x or greater than [dice], they automatically pass their saves. Any creature who fails their save against this spell has their consciousness and higher brain functions suppressed and revert to a feral state, becoming beasts in their own mind. They have no loyalty to you. Additionally, they will retain their base personalities, though in a much blunter form. For example, if a man who loved his wife was affected by this spell, he would still protect her while affected by the spell, and if any man got to close or too friendly to her for his liking, he would growl and snarl at them. [dice] pieces of technology within range immediately malfunction and stop working. If they are a piece of technology that could not malfunction, such as a shoe or a sword, they instead fall apart and break. If you cast this spell with 4 or more [dice], all the technology targeted automatically breaks, and will need major repairs or to be replaced. A total number of Undead with total HD of [sum] or less must save. If the Undead have more HD than [dice], they may add the difference to their save. If the Undead have 3x or more HD than [dice], they automatically pass their save. Any Undead who fail their save against this spell are instantly destroyed, their false souls freed from their rotting shells. When you cast this spell, select [dice] trees within range. Each tree will be compelled to act, taking one action against a target you specify. Once each of the specified trees have taken an action, the spell ends. If you wait more than [sum] minutes though, the trees will finally decide you have wasted enough of their time and stop listening, ignoring further commands unless you cast the spell again. You can make a tree interfere with someone's action, such as shifting a root potruding slightly out of the ground upward so that he trips, or lowering a branch so it tangles the overhead swing of his arm. This automatically imposes a penalty equal to [dice] to the person attacking. You can also make a tree attack someone by dropping a branch on them. The target of the attack gets a saving throw. On a success, they take no damage. On a failure, they take 1d12 damage as a branch falls on them. Creates a wall of plant life that bursts from the ground in a line 10*[dice]' long. This plant life is thick and impossibly dense, and has [sum] HP. It is too wet to burn, so only fire spell of second level or higher can damage it. It must be hacked through with melee attacks to penetrate its defenses. Additionally, anyone hit by it takes [dice] damage. Smaller buildings are also hurt by this as well, taking the same amount of damage. Casting this at first or second level is strong enough to destroy a hut, thatch-roofed cottage or a yurt. If this spell is cast with three or more dice and the line extends through the wall of a stone building or a wall, it can damage those structures as well. Also, remember that the type of Folk summoned depends on where you are. If you are in a city, you will find very different Folk those in the virgin wilderness. You will need two creatures for this, of the same size. The more similar they are physically, the better. One creature is to be designated the Source and the other the Vessel. You will need both creatures to fail a saving throw, or consent, if they can. Then, if both creatures are in agreement or failed their saving throws, have the Vessel kill and eat as much of the Source as they can. Then the Source must make a save. If they succeed, their spirit leaves their destroyed body and possesses the Vessel's body. If the Source fails their save, they instead die. The Vessel's body then slowly changes shape until it resembles a younger version of the Source. At this point, you should have the Source make a second saving throw, with a penalty equal to every physical point of difference between the Vessel and the Source. A point of difference is when the Source and Vessel were from different species, races, sexes, one possessed a major difference in physical ability or something else that was different about the Source and Vessel's body, applying Referee's discretion of course. If the Source passes this second saving throw, no additional effect. However, if the Source fails their second saving throw, roll on the table below. 6- I have gained terrible knowledge from beyond the Void of Death and I have been seized by new purpose and madness. Or perhaps, I am sane and you are the mad ones? 1- You cannot stop talking for 1d10 minutes. If you stop talking "in-character" for more than a round, you lose 1 spellcasting dice. 2- You take 1d6 damage and start bleeding from every orifice. 3- For the next 1d10 hours, you attract animals. These animals have no special loyalty to you or are inclined to listen to your commands. 4- One random piece of technology within 100' breaks. 6- A swarm of nuisance animals burst out of the ground and cause a ruckus. This can be a colony of bats, a flock of birds, a swarm of rats, etc. 1- You turn into an animal as per Wild Shape for 1d10 minutes. 2- A Civic Master appears and tries to hurt you. City Masters are basically anthropomorphized streets, buildings, or landmark. The Civic Master has 1d10 HD and an AC of 8, makes a slam attack at -6 doing 1d20 damage, and can only be hurt by something that could damage a building. Axes, sledgehammers and explosives are good, daggers and arrows and bullets are not. Referee's discretion applies, of course. The Civic Master pursues you until manage to escape it or it dies. If you escape from it, it will wander until it finds the nearest city, then it will enter and transform back into a building or statue or road. 3- You trigger an earthquake as if you cast the spell Earthquake as level 1d4+1 spell. 5- One random flammable object within 100' lights on fire. 6- A 1d6+2 HD animal appears in front of you and it is angry. The animal will begin attacking anyone who comes near it until it is killed or driven away. Doom of Fools- You are teleported to an uncharted, savage wilderness for 1d10 minutes. After the time limit is up, you are instantly returned to wherever you were when you were initially teleported. Doom of Kings- As above, but for 1d10 hours. Additionally, everyone within 30' is sent along with you. All teleported to this distant location are returned with you, as long as they are still within 30' of you when the time expires. You know this, but whether you tell anyone is up to you. Ultimate Doom- As above, but permanently. Additionally, everyone within 50' is sent along with you. This Doom can be avoided by becoming an Archdruid or by destroying a suitably large artifact of civilization, such as a library of irreplaceable books, a cultural treasure, a legendary magic artifact or perhaps something more spiritual, such as a kingdom, a nation or a religion.